Syria migration crisis: Why is Germany taking in so many refugees? Why Is Germany Taking in So Many Refugees? 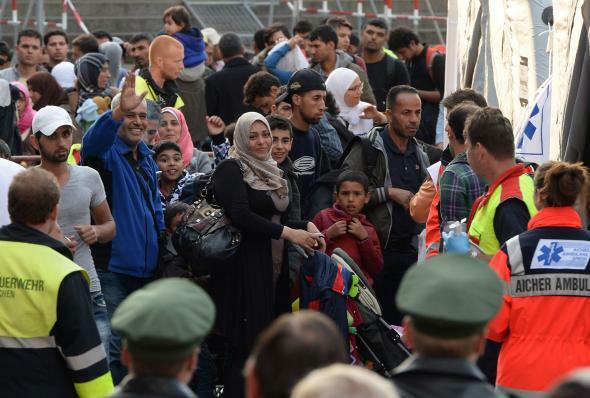 Incoming refugees wait for a short medical check after their arrival at Munich’s main train station on Sept. 5, 2015. This welcome seems to have blindsided international media, especially the reception at the Munich train station with a huge applauding crowd and the police having to ask people through Twitter not to bring more donations because the station is overflowing. Joseph Stiglitz and certain others, who have found much international acclaim during the Greek crisis by asserting that Germany is merciless and hasn’t learned its lesson from two world wars, will find it much more difficult to convincingly claim so in the future. That is certainly one of the reasons that German Chancellor Angela Merkel has placed herself at the head of this new movement, but as usual she did not do so until the movement and its direction were very clear and people had started to ask why Merkel was keeping silent. Merkel can take credit for dismantling the disgraceful Dublin III Rule, but she cannot take credit for the warm welcome that refugees are receiving here. If you include the German-speaking refugees who were expelled from Eastern Europe after World War II, almost half the German population has heard their parents or grandparents tell the story of leaving everything behind and moving to a strange new place. In 1945, we had to find room for more than 10 million refugees in a country that was rubble, lacking housing and basic infrastructure. Germany managed and came out stronger. After that, who can seriously claim that 800,000 refugees are going to be a problem for Europe’s top economy in 2015? There is censorship of hate speech, so racist comments can cost you a fine, but mostly this is a socially enforced taboo. And it goes far beyond the legal basis: any Anti-immigrant comments are taboo and make the speaker an instant outcast. Closely related, there’s a lack of patriotism and a taboo on patriotism. Many Germans are not able or comfortable defining what being German even means. There is no patriotic education in schools—rather the opposite. People see themselves as citizens of their region and/or of the EU, whil “Germany” remains quite abstract. Patriotism is considered nonsensical at best (being born in this place or that is not an achievement) and equated with nationalism or xenophobia at worst. However, the taboo against, for example, owning a German flag and similar expressions of patriotism has relaxed quite a bit in the past two decades. I think it was 1999 when we had a huge public debate about whether a politician saying “I’m proud to be German” is, by itself, xenophobic. He had to resign. But during the world soccer championship 2006 in Germany, Germans were amazed that the foreign visitors were more unambiguously proud of Germany than they themselves, which started a debate and some relaxation. Nowadays, a significant share of the population is ready to say they’re proud to be German, though many will silently add, “For being basically the only nation that has recognized patriotism as the root of much evil and done away with it.” Paradoxical as it may be. If interested, Iranian-German author Navid Kermani elaborated a bit on this very peculiar brand of patriotism. Of the parties in German parliament, none run anti-immigrant lines such as you might hear from the Front National in France. The biggest party with an anti-immigrant stance, the AfD, has 3 percent in polls. Of the established parties, the strongest anti-immigrant noises can be heard from the CSU (a special conservative party that only exists in Bavaria, merged with CDU on the federal level), which express the fear that Germany will become less Christian. However, it has to be careful not to overshoot. Its talk of a German Leitkultur (guiding culture) or alternatively “Judeo-Christian Occidental guiding culture,” as an alternative to multiculturalism, was received negatively in public debate and lost them votes. Some parts of the CDU sometimes say similar things, but Merkel doesn’t; she famously said, “Islam is undoubtedly part of Germany.” The other parties are more immigrant-friendly than CDU and CSU. The most successful anti-immigrant voice has been Thilo Sarrazin, former head of the federal bank who wrote several best-sellers predicting Germany’s decline as a result of immigration from Muslim countries and high birth rates among Muslim immigrants. He also claimed that immigrants are more likely to be criminal. As a result, he was fired from his position with the federal bank and lost his party membership with the SPD. Still he has some followers among the middle class, people who wouldn’t dream of voting for the extreme right, because he extensively uses statistics and math in his books, giving the appearance of narrating facts rather than xenophobic crap. The lowest of scum in terms of media focuses on the nationality of a criminal more often than it should, and it was quite happy to feed prejudices against Greeks during the crisis, but it can be depended upon to follow CDU party line, so the current tabloid articles are all condemning racists and encouraging people to get involved in pro-refugee initiatives. I’m not saying that people want to have Syrian refugee neighbors, because it is said to bring down the value of real estate, and there are prejudices against Arabs of course, helped by Sarrazin, but Germans are proud that Germany is helping. And as Merkel and others have pointed out: It is quite amazing and something to be proud of, given history, that Germany has become a country that all are vying to emigrate to—a more popular destination than Italy, Austria, France, or the U.K. Germany is enjoying this change: Before, during the Greek crisis, and actually for most of the past 70 years, Germany was the bogeyman. Now, it’s a beacon of light. European refugee crisis: Why is there a sudden influx of migrants into Europe in recent months, given that the wars in Africa/the Middle East started years ago? Germany: What is it like to live in Germany? European refugee crisis: What should Europe do to address / solve the migrant crisis?